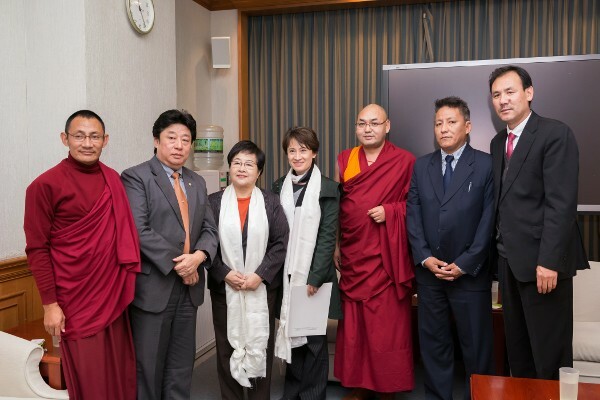 (TibetanReview.net, Dec13, 2014) – A delegation of six exile Tibetan MPs from Dharamshala, India, led by Deputy Speaker Khenpo Sonam Tenphel, met with Taiwanese MPs and others and held a discussion about the issue of Tibet during their Dec 7-9 visit to Taipei. The exile Tibetan administration said on its Tibet.net website Dec 11 that the delegation called on MPs Mrs Bi-Khim Hsiao and Mrs Chen Jhe Ru of the opposition Democratic Progressive Party. It added that the delegation urged the Taiwanese lawmakers to help establish more Tibet support groups in the country, raised the possibility of admitting Tibetan students in Taiwanese universities, and sought help in resolving the visa renewal problems being faced by Tibetan monks in Taiwan. On Dec 8, the delegation held a public discussion which was jointly organised by the city-based office of Tibet and the Tibetan-Chinese Friendship Association. Tibet.net said that among those who attended the discussion were students, intellectuals, civil servants, social workers, as well as democracy activists from Mainland China. The delegation, whose other members included Mr Gyari Bhutuk, Mr Karma Yeshi, Ven. Mogru Tempa, Mr Bawa Kelsang Gyaltsen and Khenpo Norbu Tsering, also gave talks on the Dalai Lama and his contributions to the Tibetan cause on Dec 8 and 9 at separate venues.